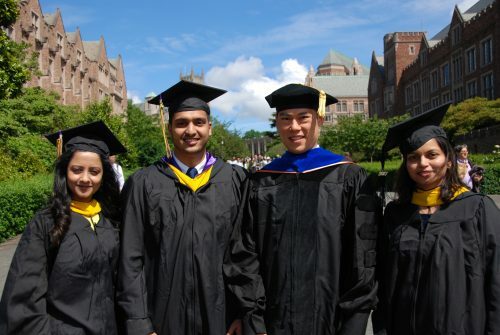 The University of Washington’s MS-CFRM leads the field of quantitative finance and financial engineering programs in terms of flexibility: our domestic and international students, with or without prior finance industry experience, can attend full-time or part-time, on campus or online, completing the CFRM curriculum alongside students ranging from brand-new college grads to senior professionals. Even embarking on the degree comes with options: students can begin the MS program directly or can prepare in stages with our certificate programs. The MS-CFRM, offered by the Department of Applied Mathematics (AMATH) within the College of Arts and Sciences of the University of Washington, can be completed either through the standard 42 credit general program or an extended course of study. As with other MS and PhD degrees at the University of Washington, the MS-CFRM degree is awarded by the University of Washington Graduate School. All students pay the same price per credit, which is assessed annually and subject to change effective each summer quarter. We do not charge nonresident or international tuition rates as a result of our self-sustaining status. For the 2019-2020 academic year, the fee rate is $1,020 per credit. The complete 42-credit MS costs $42,840 in course tuition. This does not include UW student fees and assessments, such as mandatory charges for registration, technology services, the universal U-PASS (public transit), and UW student activity fees. These vary, but are generally less than $500 per quarter. Course fees also exclude optional university charges, such as health insurance, student housing, and meal plans, as well as textbooks and other personal expenses. Some students may be recommended or required to take preparatory courses to fill skill gaps or refresh their coursework. These 400-level courses are offered at a rate of $505 per credit. Additionally, academic credit for an organized internship or international CPT opportunity are charged $205 per credit of CFRM 601. Neither of these course types count toward the 42-credit program minimum. Limited scholarship and financial aid funding is available for program students and is generally evaluated along with the application process. Opportunities for funding through research or TA appointments are infrequent for students in the MS program. Upon an offer of admission, new UW graduate students in the MS-CFRM will be required to pay an Enrollment Confirmation Deposit (ECD) to reserve your place in the program. The full amount of this deposit will be applied to your account balance. However, the ECD is nonrefundable; the full amount will be forfeit if you elect not to enroll in the program. Additionally, extensions to the payment deadline will not be granted. Can’t find something? Try searching the CFRM website via the sidebar to the right. If that doesn’t work, please contact us.